Thoroughly grasping and implementing the Party’s viewpoints and guideline on judicial reform, over the past years, the Central Military Commission and the Ministry of National Defence have led and directed the implementation of tasks and contents of judicial reform, gaining important results. Noticeably, the awareness of cadres, party members, especially leaders and commanders at levels about the position, role and necessity of acceleration of judicial reform has been raised. The work of building up and implementing legal normative documents on state management in the aspect of military and defence has been carried out seriously, with increasingly high quality and effectiveness; there have been practical proposals making contributions to the completion of the legal system. Process of investigation, prosecution, judging, verdict enforcement of the Army’s judicial organs has been closely conducted in accordance with the law. The task of law propagation, dissemination, and education has been conducted in various, practical measures, making positive changes. Judicial organs of the Army have successfully performed their function as advisory organs for the Central Military Commission and the Ministry of National Defence in preventing violations of the State’s law and the Army’s discipline and combating crime, making contributions to strengthening the socialist legal system, maintaining social order and safety, improving discipline practice and combat strength of the Army. During the process of judicial reform, attention has been attached to strengthening organizational structure and building cadre staff of judicial organs. As a result, the system of Army judicial organs has been built in the seasoned, lean, effective and synchronous direction, in accordance with military functions, tasks and characteristics, making significant contributions to the cause of building the Army, strengthening national defence and protecting the Homeland in the new situation. 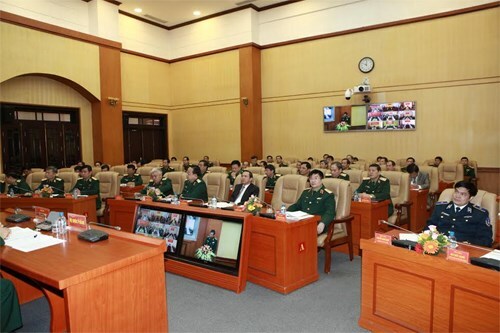 First, strengthening the leadership and management of party committees at level over the work of education to raise a sense of awareness, and implementing the Strategy for Judicial Reform in the Army. Reality showed that the limitation of awareness and responsibility of cadres at levels is one of the main reasons leading to irrelevant implementation of the Strategy for Judicial Reform over the past 10 years. Thus, raising awareness and sense of responsibility of cadres and soldiers, particularly key cadres at levels is of top importance to enhancing the effectiveness of judicial reform in the Army. In this regard, party committees and commanders at levels should step up educating and thoroughly grasping resolutions and directives of the Party, the Central Military Commission and the Ministry of National Defence, focusing on the contents related to judicial reform specified in the Resolution of the 12th National Party Congress, the Resolution of the 10th Army Party Congress, making a positive change in awareness, resolve and responsibility of cadres and troops in the implementation of judicial reform from grass-roots levels to the whole Army. In the current situation, the task of grasping and disseminating judicial reform must be inclined towards the good behavior and the prevention of crime and violations of Army discipline and State law, making contributions to effective prevention of “self-evolution” and “self-transformation”. Thus, together with active renovation of contents and methods for dissemination and education, party committees at levels, given the situation and the task of the unit, should clearly set out guidelines and methods to lead judicial reforms, and targets for each period. Second, innovating and enhancing the quality and the efficiency of judicial organs. This is an important matter deciding the quality and the effectiveness of judicial reform in the Army. It is because those are core contents to strengthen State law and Army discipline practice and combat strength of the Army while making contributions to defending legitimate rights and dignity of military personnel and the people, protecting the Party, the regime, and the national unification and territorial integrity. To successfully implement those contents, party committees and commanders at levels should adhere to the Party’s guideline on judicial work, the direction and guidance of the Central Judicial Reform Steering Committee, the Ministry of National Defence, the situation of units to enhance the quality and the effectiveness of task performance of each sector. As for the Army Criminal Investigation Sector, apart from having good forecast and management of the violation and crime matter in the entire military, it should proactively study and suggest party committees and commanders at levels measures to effectively prevent and fight against types of crime. As for the Military Courts, it is necessary to promote judicial rights implementation in the direction of renewing the mode of judging from mainly focusing on interrogation to court proceedings to ensure democracy, openness, and transparency. Also, it is important to step up administrative procedure reform within the courts, effectively carrying out the task of developing and promulgating legal precedents to make new changes in the process of judging. Together with following the law, the task of innovating and enhancing the quality of investigation, prosecution, judging, and verdict enforcement of must be inclined towards good behavior, humanitarianism, focusing on prevention. Third, building pure and strong judicial cadre staff meeting the requirements set by the process of judicial reform in the new situation. On the basis of strictly implementing the Central Military Commission and Judicial Sector’s viewpoints, principles and process of building cadre staff, it is necessary to focus on building sufficient judicial cadre staff with better quality, meeting the requirements of the Army building and judicial reform in the new period. In this regard, party committees and commanders of judicial organs at levels should grasp the situation of the cadre staff in political virtue, occupational morality, lifestyle and professional competence to set out guideline and measures properly. The tasks of planning, appointing and using cadres must be conduct closely, ensuring inheritance, being appropriate to functions and tasks of each sector of judicial organ system. Continuing to improve the task of training judicial cadres in the direction of basic foundation with modern orientation, improving both professional competence and knowledge on aspects of politics, economics, society, foreign languages and IT. Fourth, strengthening collaboration among relevant functional forces to effectively carry out the task of judicial reform. Close collaboration among relevant functional organs is an important content, creating combined strength to meet the requirements of judicial reform and Army building. In this regard, it is necessary to consider education and prevention as the main contents and administrative measures as the important ones. When an incident occurs, collaboration among judicial organs must be conducted closely and comprehensively in all steps ranging from proceedings, investigation, judicial supervision to the process of judging and verdict enforcement. In the context of the country’s increasingly deep integration into the world, Judicial Sector should encourage international cooperation and implement signed international conventions and judicial assistance agreements with other countries effectively. In this regard, it should promote cooperation on aspects of information and experience sharing, crime prevention and combat, justice assistance and cadres training, particularly foreign languages, cyber security capabilities and professional competence in international justice, making contributions to accelerating the process of judicial reform, building the Army, strengthening national defence and firmly safeguarding the Homeland in the new situation.